With the Veyron coming up on its 10th birthday, another special-special edition won't do. So blueprints for the Bugatti's next hypercar are being drawn up, and that includes a hybrid system to boost the already insane 1,200-hp SuperSport to 1,500 hp. Yup, the Veyron is old enough to get into 5th grade, and Reuters reports that the follow-up is being developed by VW and should debut next year. According to unnamed sources at the automaker, Bugatti's new beast will use a variant of the quad-turbo, 16-cylinder engine in the current Veyron, but will get an additional boost from a hybrid system that will bring output to around 1,500 hp. Considering Bugatti's new CEO, Wolfgang Duerheimer, headed up R&D for Audi and Porsche, the move to a hybrid system isn't that surprising. And of course there's the latest batch of hybrid super cars from Ferrari, McLaren, and Porsche setting the trend. 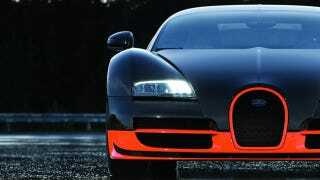 But the most interesting bit are sources saying that the new Bugatti will blow past the SuperSport's 268 mph top speed. That's going to involve some serious aerodynamic work, and that and the packaging of the hybrid system, the VW brain trust will have their work cut out for them.